Call us today for unique hobby ideas! Are you interested in picking up a new model figure for your son or daughter? Maybe you're an expert modeler that's looking for a new challenge? Whatever the case may be, John's Models has got you completely covered! We retain an extensive inventory, and cater to all the hobby and model enthusiasts of Pensacola! 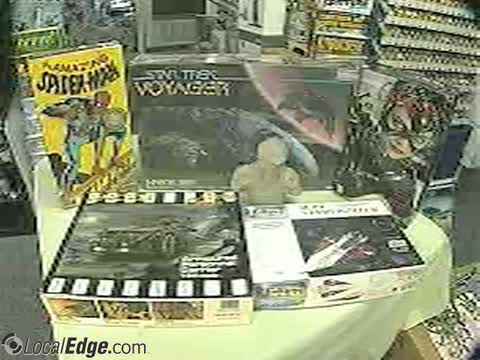 John's opened doors for business way back in October of 1996, and has continued to serve the greater Pensacola region with unbeatable models and figures ever since. It's really no wonder that folks keep coming back to our retailer time and time again; our selection of rare and unique modeling supplies just can't be matched! Back in 2000, our shop doubled in size, and added a meeting room for many of the hobby groups throughout the region. Since then, John's has become a favorite destination of model figure enthusiasts the state over. Browse our wide selection of model figures for the people of Pensacola. In 2003, John's Models acquired Ft. Duquesne Military Miniatures. Our team now manufactures model figure and model conversion kits of the highest quality. When it comes to models, we can just about do it all. We also boast more than 5000 models within our inventory, and purvey a huge selection of paints and supplies. We'll even appraise your current model collections, and help you to buy or sell separate pieces. Where else are you going to find this type of customer service? We offer exquisitely crafted models and figures for all enthusiasts. If you wish to gift a new hobby item to your child or are simply looking to new ones to your existing collection, we have got you covered. In addition to selling quality products, we also help customers who need appraisal services for their collection or wish to sell their collection. If you reside in or near Pensacola, be sure to visit our store to browse our collection of high-quality models and figures. A model figure is a scale model of a human, monster or other creature. Human figures come in the form of generic figures, historical personages and fictional character. Our model figures are sold as both kits and already built collectible figurines. Do you want a special model figure that you can't find anywhere else? We might have it! We cater to all the residents of Pensacola, offering up rare products at the most competitive prices. Though our facility is a bit off the beaten path, it's well worth the trip! Stop by to view our model figures today. Start a new hobby today! John’s Models is currently recognized as the home to The Pensacola Modeleers and The Panhandle Miniature Figure Society. The Modeleers meet on the 2nd and 4th Saturday of each month at 1 PM, and would love for you to drop by. The Figure Society meets on the 2nd and 4th Thursday of every month at 7 PM, and are also welcome to all visitors. Both of the groups are extremely active throughout the community, each sponsoring an annual show and assisting with exhibits at the National Museum of Naval Aviation. You're not going to want to miss out on these exciting events! We provide the model figures you want to Pensacola! We offer a full slate of products for both experts and novices alike, and would love for you to stop by the shop for a chat. Whether you are looking for a new hobby suggestion or want to finally tackle that model sailboat, we'll be able to find what you need. We are confident that we'll have a model for you to work on! Please give us a call for more information about our hobby products in Pensacola, FL! Johns Models, serving the Pensacola area, offers a variety of model figures. Are you looking for the perfect gift for the model hobby lover in your house? How about model ships or Nascar models? At John Models you will find of kinds of model paints, model supplies, model conversion kits, collectable models and much more. We even offer model appraisals. Contact us today for models and other hobbies.